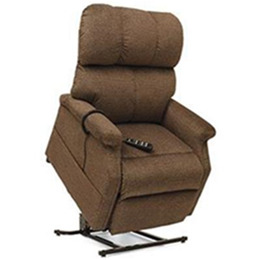 This SR-525 Lift Chair is available in a wide variety of fabrics including, but not limited to: Ember, Field, Oat, Deep Sky and Timber. Top of Back of Seat: 25.5" - 27.5"
Distance from Wall: 28" - 30"
Overall Chair Width: 32" - 28"
Chair Weight: 123 lbs. - 130 lbs.